My wife and I have decided to move across Europe by train. Do you know of any good sites for planning a trip via train (schedule and maybe prices)? We're going to go across Europe from east (Russia and Baltic countries) to west (France and Germany). I've found only one so far: OEBB. Seat 61 is the absolute definitive guide for international rail travel. It has all the information you need about routes, prices, and schedule. It also has plenty of links to the places where you can price up and buy tickets, and where to buy them if you can't buy them online. If you have more specific questions you can ask them here obviously. For route planning, the German Railway's website - http://www.bahn.de - is unbeatable for working out how to get from Helsinki to Madrid by train. It doesn't cover the ticket purchasing for journeys outside Germany though. I'm surprised no answer so far has mentioned Raildude. This is a very useful, community-driven website for international trains in Europe. It is particularly focussed on budget travel, and indeed originates from a Interrail-related website. It is not complete. It's all-to-easy to think it is complete because it has so many trains, but it is not. In my experience, the further from Germany, the more trains are missing. I've taken decent trains in Spain that were not registered in Hafas. It is even less complete around timetable shifts. Each year in the beginning of December, timetables change. Around the shift of timetables, Hafas is very incomplete, even in Germany. In practice, planning a Christmas holiday is not possible with a Hafas-based search engine, because so many trains are missing or only registered extremely late. The different Hafas-based search engines have slightly different features. For example, B-Rail permits to specify the maximum number of connections, whereas Bahn.de allows to specify the minimum change time. Most allow to have one or more via stations. By combining those features, one can often get a much better connection than to simply write Stockholm to Madrid in an arbitrary search engine. For example, you may want to avoid changing trains in the middle of the night, or increase the transfer time after a train that is often late. If possible, use the various national railway websites to double-check the timetable obtained with Hafas. For example, inside Spain, Renfe have a much more complete and reliable timetable than any international website (although they cannot list connections with more than one transfer). Most, if not all, countries have national railway company websites. This list on Wikipedia might get you started. The German forum Drehscheibe Online has a list of PDF timetables for the various national railway companies, where available. Personally, I love to browse paper railway timetables. However, for most countries it can be quite hard to find the correct timetable. For long-distance trains, browse earlier-mentioned websites such as Seat 61 and Raildude. The latter specifically mentions connections between major cities, whereas the former is mostly written from a UK perspective. I suggest to use InterRail pass instead of buying tickets. This is cheaper if you plan to travel more than few thousand kilometers. Finally, for dreaming, check Orient-Express. The site that stands out by a mile is seat61.com. Really well written, very comprehensive, and has all the information you'll need on how to book when you've decided. I use it all the time! EURail should be a good place to plan the trip. They do go as far east as Poland and Bulgaria, but no further than that. EuroStar is another network that may be useful, but it stops short of EURail on the eastern side. DB TravelService has schedules that will cover the whole trip, apart from the buses in the Baltic countries. It only has fares for trains within Germany. And for some trains to and from Germany. Go Rail for the trains from Moscow or Saint Petersburg to Tallinn. Lux Express is operating buses between the Baltic countries, but also between Tallinn and Saint Petersburg and Vilnius and Warsaw. For train travel within Poland, use the PKP route planner. For train travel to and within Germany, use DB TravelService. For train travel to France, use DB TravelService or Voyages SNCF. For train travel in France, use Voyages SNCF and possibly TER SNCF for local trains. If you travel through Belgium, SNCB Europe can be helpful for the long distance trains and SNCB/NMBS for the local trains. On the site, it is also available as a 14Mb PDF that you can zoom for details. As speed/duration depends on many factors, the map only distinguishes between high speed lines, main lines and other lines. As mentioned by others Seat 61 is really the bible for European train travel and I would have been lost without it when planning and booking our train travel. It's focused on travelling from London but it's still really useful even if you're not starting your journey in London. It will point you in the right directions in terms of finding online timetables and tickets from the various operators and retailers. I also stumbled across Loco2 but haven't used it other than some quick searches. I'd be interested if there's anyone here that's used it and has some feedback. 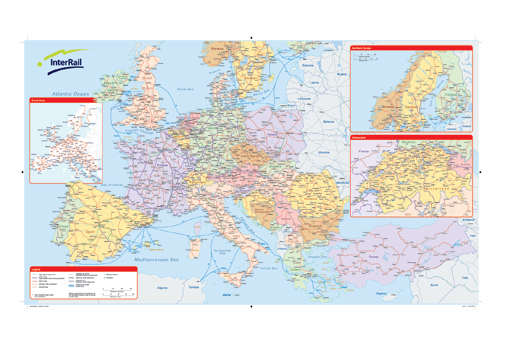 This website is awesome to find route around europe by official. Not the answer you're looking for? Browse other questions tagged europe online-resources planning guides trains or ask your own question.